The Knitting Pirate » In Which the Pirate Goes to "Sheep and Wool." « In Which the Pirate Remembers a Deadline. In Which the Pirate Goes to "Sheep and Wool." The MD Sheep and Wool Festival was absolutely fantastic, and I am definitely going back next year. Janis and I had a great day together! We fondled all varieties of yarn and roving, looked at the animals - there were sheep, goats, alpaca, llama, and bunnies - and ate lamb gyros for lunch. I had mentally prepared myself to want to buy one of everything, but was limiting it to just sock yarn... and maybe some laceweight. You know, just because. It's something new to try. 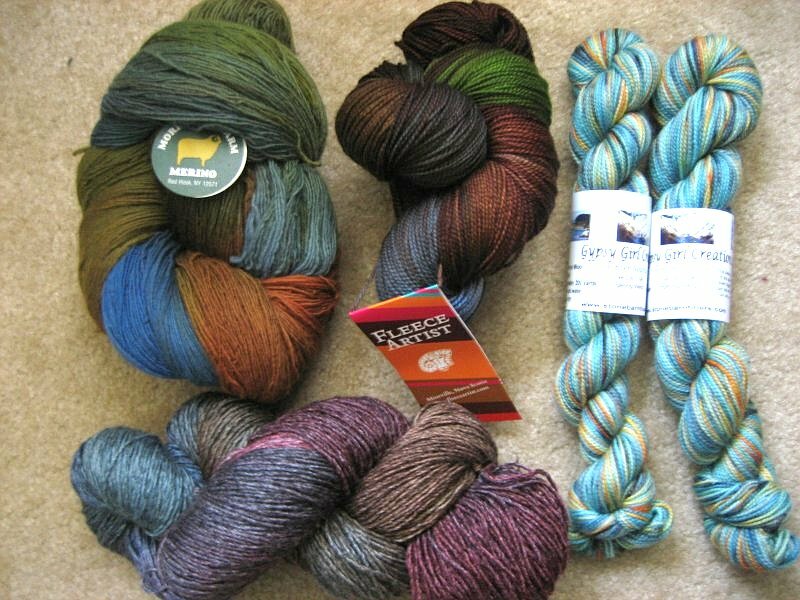 On the top left, Morehouse Farm Merino laceweight in blues, browns and greens. 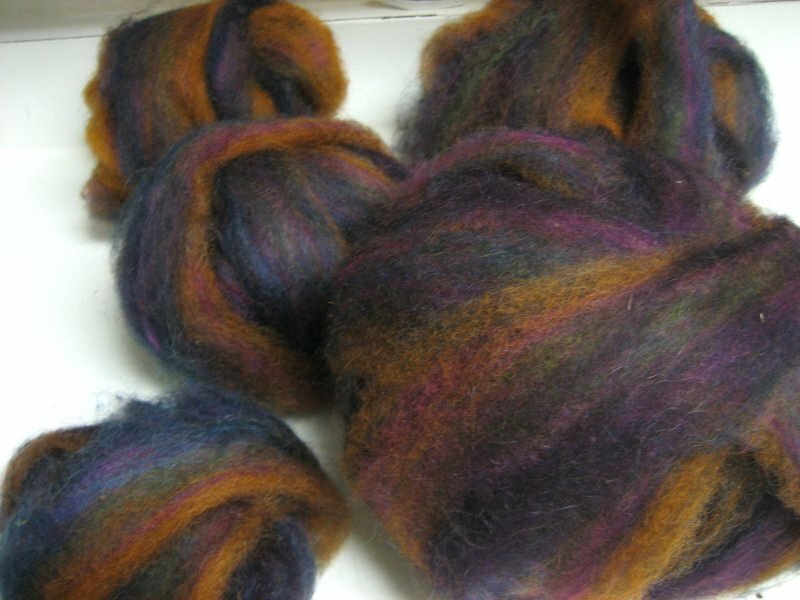 In the middle, some Fleece Artist Merino 2/6, also in blues, browns and greens. On the right, two skeins of Gypsy Girl Creations in the "Winter Solstice" colorway (shh, don't tell her, but this is a gift for a certain ninja I know. And across the bottom, some Brooks Farm Yarn Acero, a 60/20/20 wool/silk/viscose sock yarn. I usually like the greens and purple yarns best, but today I really found myself drawn to the browns and blues. There was some Socks that Rock at one booth, but they only had the medium- and heavy-weight, and by the time we got there, the selection had been so picked over that I couldn't find a colorway I really wanted, and so decided not to get any. In one tent, I commented to Janis that the roving, while beautiful and fun to touch, was not at all dangerous since I didn't know how to spin it - I could enjoy it without fear of wanting to buy it. A woman who was just paying for her purchase overheard me, and said, "Would you like to learn to spin? I can teach you in less than five minutes." We couldn't pass up that kind of invitation, and sat with her on the grass while she taught us to use the drop spindle. I admit, the first few times, I flung it a little wildly... but by the end of the day, I'd gotten the hang of it. 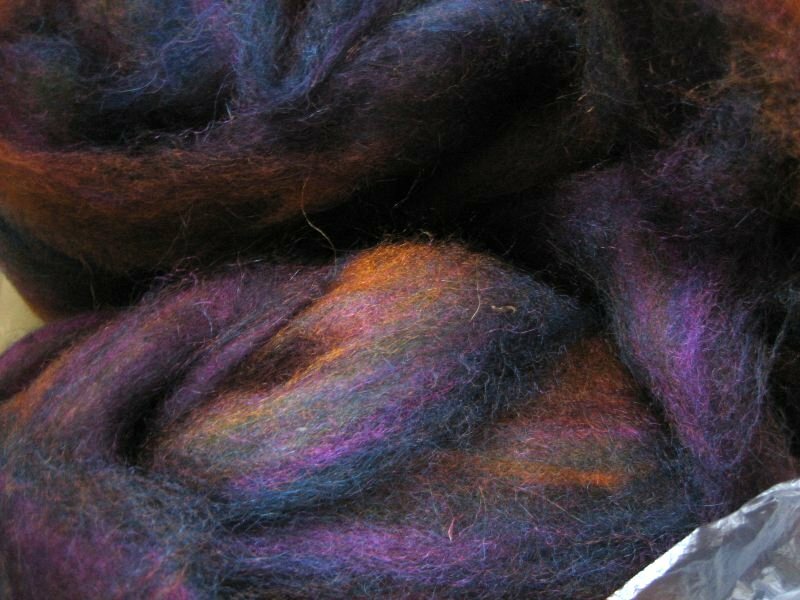 Romney was recommended to us as a good wool for beginning spinners, so we each got half a pound of it. Hers is blue-green-purple, and mine has orange and pink thrown in there too. It feels so soft, though there's quite a bit of vegetable matter stuck in it, and it smells more than a little bit like a sheep. I can pick the grass out while I'm drafting, and I'm sure the scent will come out in the wash.
Now that we had roving, we had to buy drop spindles - since wheels are a bit more space-consuming, not to mention expensive. I picked up a Cascade "Little Si" spindle, recommended as kind to beginners. Back at Janis' house after the festival, we took out our roving and spindles and attempted to make something beautiful. My very first handspun single came out fairly well, I think! It was a lot easier than the last time I tried to use a drop spindle. 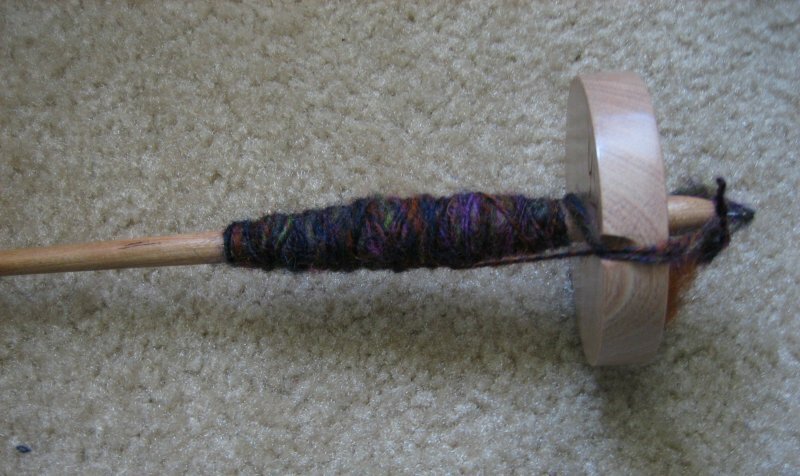 Maybe that's a matter of technique, and maybe having a good spindle makes the difference, or maybe it was a combination of both - but I actually enjoyed it this time! If it's something I get good at and want to do all the time, I'll even consider buying a wheel. I just need a place to put it... Hmm, we don't really need that dining room table, do we? 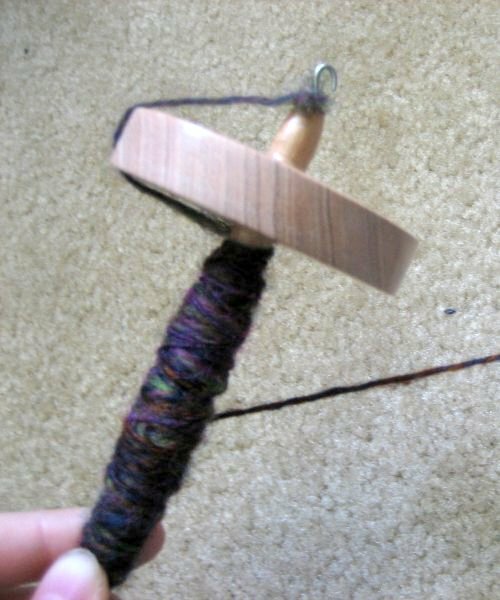 This morning I took what little I had spun and plied it together. Sure, it's a little lumpy and uneven, but it's mine! I made yarn from fluff! Depending on how I spin this up, there should be enough for a pair of socks and a hat. I'm not sure it will be even enough for socks, so maybe I should spin for the hat first. I'm thinking something felted, maybe. Or maybe I should go for yet another scarf? That might show off the yarn better. Everything's in ziptop bags now, quarantined and waiting to be frozen, just in case there are any bugs or eggs hiding in there. I don't expect there to be, but I'd rather freeze my yarn for a few days than lose it to bugs forever. Besides, that way I can't be tempted to knit with any of it - the babypants remain unfinished. 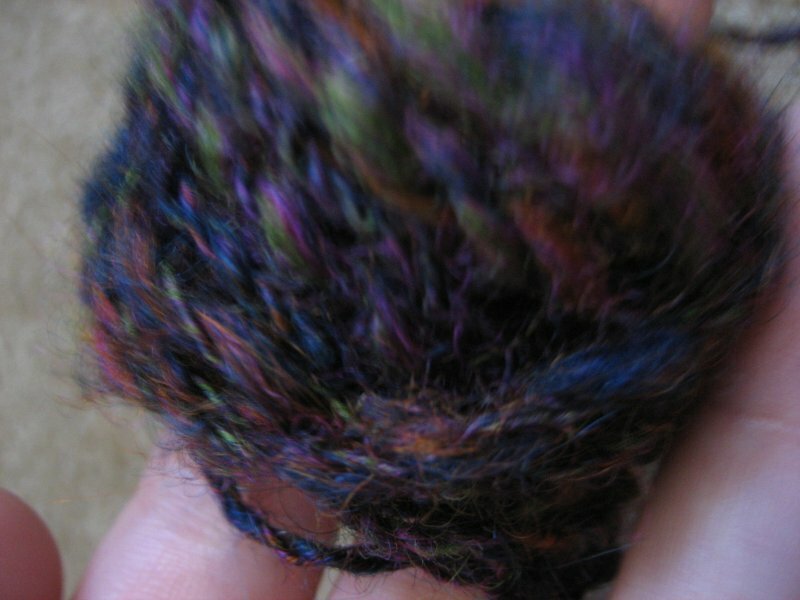 This entry was posted on Sunday, May 6th, 2007 at 12:45 and is filed under meta-knitting, spinning, stash. You can follow any responses to this entry through the RSS 2.0 feed. Both comments and pings are currently closed.